The economy is wounded – let it die! 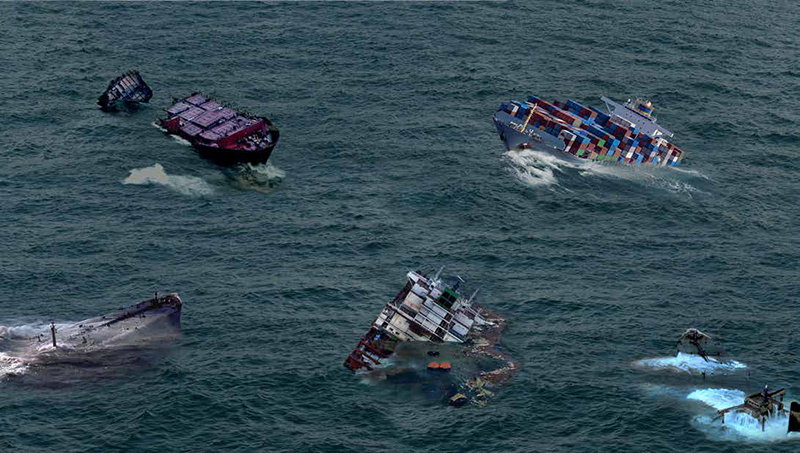 This image showing the sea with sinking vessels and container ships refers to an economic system that rests on global trade and produces ecological and social catastrophes on a daily basis. It connects to a critical discussion on climate change, which argues that catastrophic developments such as global warming can only be stopped through a systemic change, which radically reduces the so-called “free trade” of goods across the world. The rise in emissions from goods produced in the Global South, shipped in giant, diesel-burning container ships across the oceans. 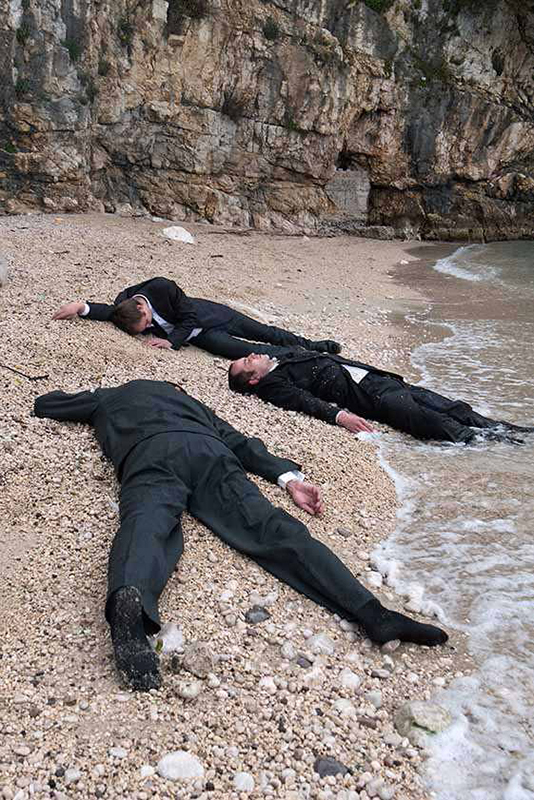 The photographic series Stranded shows men lying motionless on an empty beach. But unlike refugees these men wear business suits, the standardized clothing of politicians and managers. Their bodies are partly in the water, partly on the beach; they appear to be stranded. These images could be seen as depicting those responsible for the policy of drowning refugees. The current European Union measures go beyond “refugee deterrence”. Today the EU makes use of the catastrophe it caused itself (through support for dictatorships, political intervention in uprisings, continuous wars on terror and economic strangulation of Africa and the Near East) to prepare renewed military intervention behind the back of the population. Meanwhile, corporate executives have for decades used their global economic reach to enrich their shareholders at the expense of environmental, social and labor standards, causing entire regions to sink into poverty. In their fourth collaborative film Zanny Begg (Sydney) and Oliver Ressler (Vienna) focus on Nauru, a tiny remote island in the Pacific with 10,000 inhabitants. The title Anubumin is Nauruan for night and symbolises a certain darkness that surrounds the island. Today a new void threatens the island, rising sea levels threaten the coastal edge, which is the only area left for its inhabitants to live. The people who warden the political and economic refugees of today may well become climate refugees of tomorrow. The night is always darkest before the dawn. In recent years, Switzerland has become the global center for commodity trading. In no other country are more commodities bought and sold; nevertheless, this crude oil, copper, aluminum, coal or wheat never reaches Swiss territory because the deals are carried out completely in a virtual world. Despite its importance for the Swiss and the global economy, the public knows very little about these secret transactions. This relative invisibility in Switzerland lies in contrast with the visible, often catastrophic impact that the mining and trade of raw materials under neocolonial conditions has for people, the environment and the states in the zones of extraction concentrated in the Global South. The film addresses a relationship of exploitation between the toxic industries and inhumane jobs in the global South and the gigantic profits from commodity trading in the hands of a few persons in the Global North. The film thematizes, with reference of commodity trading, how the wealth of the North relates to poverty in the South; it undermines a dominant capitalist myth that northern “victimless” prosperity could not be causally related to southern poverty. 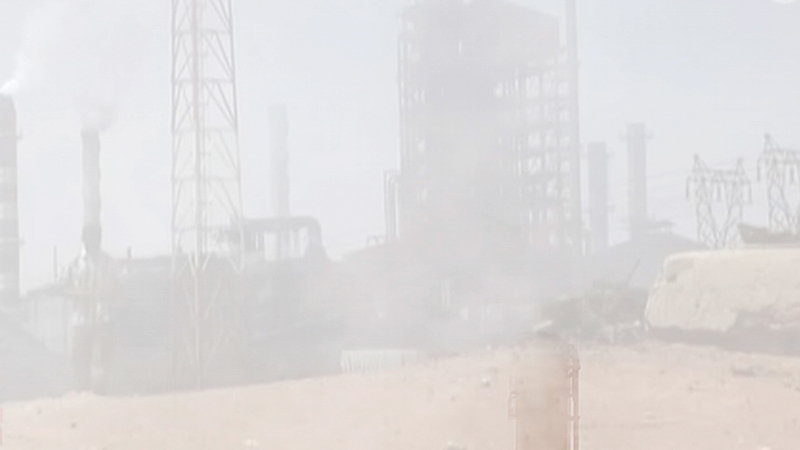 The film presents a field of view, obscured by smoke, that also points to the toxic emissions associated with production in southern places; these images are interwoven with images of corporate headquarters located in Switzerland featuring the unprepossessing name plates of Vitol, Trafigura, Mercuria, Gunvor, Litasco, Bunge and Dreyfus. Oliver Ressler’s work has focused on global warming as a central theme ever since he first began to exhibit. One of his first solo exhibitions was “100 Years of Greenhouse Effect” at Salzburger Kunstverein (1996). Several exhibitions, films, installations, billboards and photographic works on the theme have followed since then. His cycle of films “Everything's coming together while everything's falling apart” (2016 – 2019, ongoing) follows the climate justice movement in its struggles to dismantle an economic system heavily dependent on fossil fuels. In the first film activists contest the UN Climate Change Conference in Paris in 2015 that proved the incapacity of governments to commit to any binding agreement that would curtail global warming. The film on the Ende Gelände action in 2016 shifts the focus to a massive civil disobedience action at a lignite coal field near Berlin, where 4,000 activists entered an open-cast mine. The film on the ZAD focuses on Europe’s largest autonomous territory that emerged from the struggle against the new airport of Nantes in France. The film about Code Rood highlights a civil disobedience action in the port of Amsterdam in June 2017, Europe’s second-largest coal port. Ressler will present this project in relation to some other works dealing with the climate crisis. 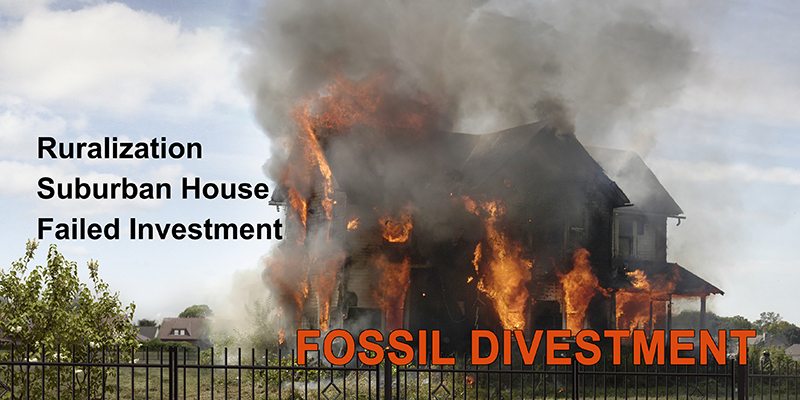 “Failed Investments“ (2015) describes suburban houses as failed investments and advocates a logical first step towards survival, namely fossil divestment. “The economy is wounded – let it die!” (2016) shows the sea with sinking vessels and container ships referring to an economic system that rests on global trade and produces ecological and social catastrophes on a daily basis. The photographic series “How Is the Air Up There?” (2018) was shot in Hambacher Forest, where Europe’s longest lasting tree top occupation is taking place to prevent the energy company RWE from extending its open-cast coal mine. “New Model Army” (2016 – 2017) brings climate movement protagonists in the form of life-size mannequins into exhibitions. 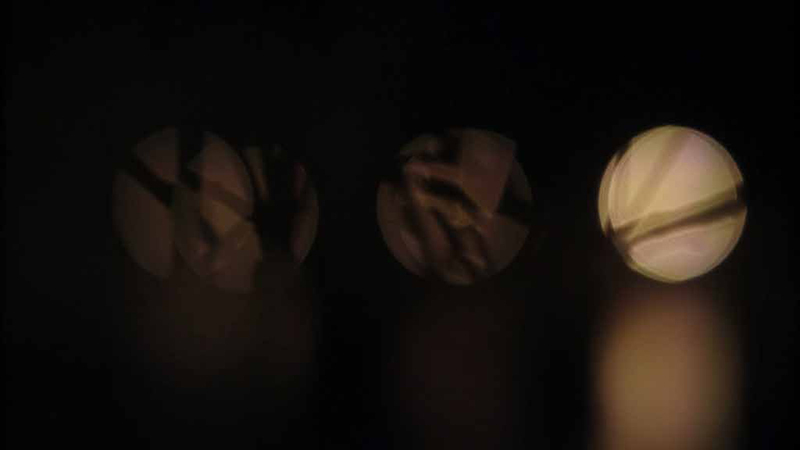 The film “Anubumin” (2017, in collaboration with Zanny Begg) discusses different threads the artist has worked on – extraction, migration, economy, the dismantling of democracy and climate catastrophe – that all shape(d) the destiny of the tiny Pacific island Nauru. Oliver Ressler, born 1970 in Knittelfeld, Austria, lives and works in Vienna. Ressler produces installations, projects in public space, and films on issues such as economics, democracy, migration, global warming, forms of resistance and social alternatives. He has completed thirty-one films that have been screened in thousands of events of social movements, art institutions and film festivals. Solo exhibitions: Berkeley Art Museum, USA; Alexandria Contemporary Arts Forum, Egypt; Wyspa Institute of Art, Gdansk; Lentos Kunstmuseum, Linz; Centro Andaluz de Arte Contemporaneo – CAAC, Seville; MNAC – National Museum of Contemporary Art, Bucharest; SALT Galata, Istanbul. Ressler has participated in more than 350 group exhibitions, including Museo Reina Sofía, Madrid; Centre Pompidou, Paris; the biennials in Seville (2006), Moscow (2007), Taipei (2008), Lyon (2009), Venice (2013), Quebec (2014), Jeju (2017), Kyiv (2017) and at Documenta 14, Kassel, 2017 (exhibition organized by EMST). Ressler was the first price winner of the Prix Thun for Art and Ethics Award in 2016. For the Taipei Biennale 2008, Ressler curated an exhibition on the counter-globalization movement, A World Where Many Worlds Fit. A travelling show on the financial crisis, It’s the Political Economy, Stupid, co-curated with Gregory Sholette, has been presented at nine venues since 2011.